The unusual frangipani tree, with large leaves and bright summer blooms, can turn a ho-hum landscape into an exotic, tropical showplace. Often called plumeria tree (its scientific name), the frangipani is the proverbial Ugly Duckling in winter - losing its foliage and leaving you with an oddly-shaped bunch of sticks in the ground. 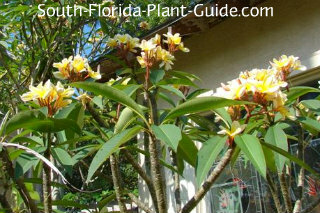 Luckily winters are short here in South Florida, though many a newcomer to South Florida has been known to pull out a frangipani tree in winter, thinking it's dead. In spring, the frangipani is transformed into the Beautiful Swan...new leaves appear, followed by late spring/early summer blossoms in gorgeous colors. The plant flowers its little heart out until fall when weather begins to cool down. Flowers of the frangipani tree come in shades of pink, yellow, white, red and multi-colors, and they're fragrant (even more so at night) as well. The essential oil from the blossoms is used in things like perfumes, lotions, and candles. In Hawaii, frangipani flowers are used to make leis. 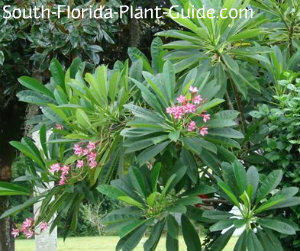 An unusual variety of frangipani is called "Bridal Wreath." 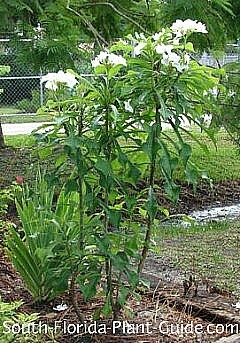 The flowers are white and the plant grows more compact and upright, making it a good accent by the entry or in that skinny spot next to the garage door. Bridal Wreath is considered evergreen, though it may defoliate in a harsh winter. Why are some flowers more fragrant at night? Plants use scent to attract certain kinds of moths to pollinate their blooms. Frangipanis grow at a moderate rate to heights of up to 20 feet, though most seen in home landscapes are kept pruned about 6 to 8 feet tall. They need plenty of sun and work very well in hot, dry areas. The frangipani tree does best in Zone 10, though some may survive in warmer areas of Zone 9B with frost protection (or in pots brought in during cold snaps). These are succulent plants, with stems full of liquid (a milky sap), so they don't do well in cold weather. This is a deciduous plant, so a central, focal point placement in landscape design can look strange in winter. 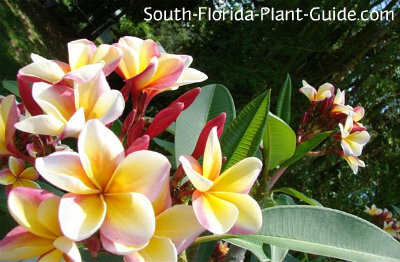 The frangipani is salt-tolerant and drought-tolerant, though you'll need to keep it watered during dry spells. It actually prefers a regular drink but with time to dry out between waterings. Frangipanis are wonderful for thriving on neglect...little care is needed other than a sunny, well-drained area, water and fertilizer. No soil amendments are necessary but adding composted cow manure to the hole when you plant is a plus. Fertilize in spring, summer and fall with a top-quality granular fertilizer high in phosphorus (or supplement with bone meal) to promote heavy blooming. 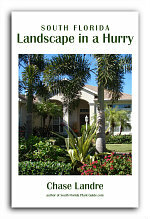 You don't have to trim this tree, though you can prune it for shape during warm months. Occasionally a frangipani tree will become top heavy and need to be staked. The leathery leaves can develop a condition called "rust" (and it looks just like rust) - though you can spray with a fungicide, the leaves are going to fall off in winter anyway, so it does no harm to the plant to let it slide. This plant will easily adapt to being fairly close to the house, so you can plant it 4 feet or more away, far enough to clear any overhang as it matures. If you plant too close to a structure, the plant will tend to lean out at a precarious angle because all growth is on one side. A frangipani will do very well in a container while it's still small and manageable. Propagating is easy and stem cuttings are perfect for containers. 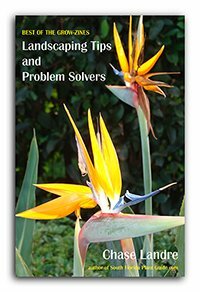 The trick is to let the sap of the cutting skin over before planting it - just toss the cutting into the garage or a shady, dry spot overnight, then plant it the next day. 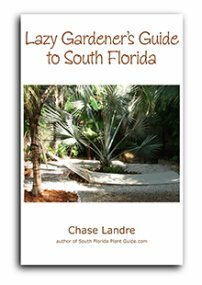 COMPANION PLANT SUGGESTIONS: Use with other drought-tolerant plants with a tropical look, such as crown of thorns, fountain grass, coontie, dwarf clusia, dwarf bougainvillea, and railroad vine.